Who said Christmas isn't fun?! Well Sometimes it isn't easy to buy for your brother,dad, husband or even boyfriend. 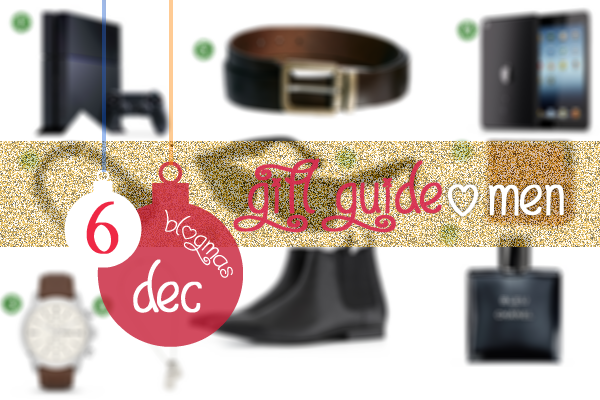 But I came up with a Top 10 Gift Guide which is for all men and lads out there, so if you're stuck you can always have a look at this gift guide for inspiration. Christmas is always a fantastic time to sit down and think. Think about what they have mentioned in the past that they had their eye on or something that you think would go great with that jacket they have just bought. It's the little things that make a gift worth more than the price! Men & lads out there always go crazy for new consoles ( I'm a girl and I still go crazy myself! I have owned all 3 playstations growing up! ) So why not treat him to the new Console that has just hit shelves just days ago! Music is all around us and there isn't a man out there who hasn't needed a good pair of headphone to listen to music on the go or travelling. I have always been a fan of Fossil Watches for the guys, They have had some amazing pieces and alot of vintage-like pieces. This particular one looks like a perfect piece to dress up or down for the office or the weekend. You can never go wrong with dog tags if you are buying a small present for the Mr. You can always personalise them by engraving your anniversary or your initials on the back! Well This is a must, we don't really want to see any more boxers or briefs! A lovely leather belt will go with any skinny jeans or pants and is always a key piece in a man's wardrobe. Don't you just love a man in boots? Black Leather boots just finish off any look for a dressed up or down night out into town. You can never go wrong with a pair from Topshop, tailored to the T, they always look sleep and handsome. A staple in a man's world, a pair of Raybans and if he's not into a load of colour, go for the original wayfarers in Black. This is for the man who doesn't have time for a laptop, computer or just wants a handy gadget to check his facebook, play a game and read a book whilst he's on the train. Others might find it useful as an organiser and easy access to pictures or files used at work. You Can never go wrong with an iPad. This lovely Wallet is for a younger generation, hip and stylish with a zip to hold all his change and not too serious. The most wanted NEW Scent that drives any women insane is the Chanel Bleu De Chanel Fragrance. It's Elegant and it's masculine, what every guy should own. 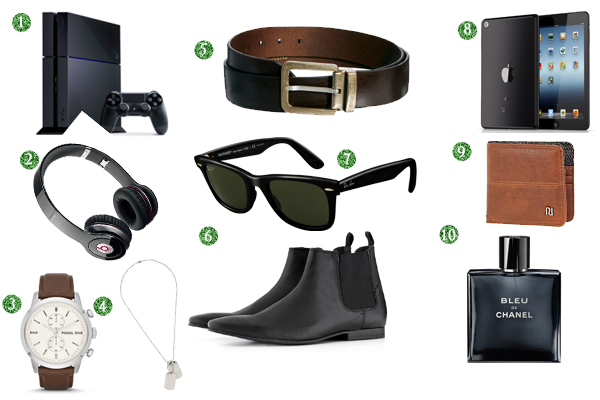 THOSE ARE MY TOP 10 GIFT GUIDE FOR MEN, WHAT IS YOUR GIFT GUIDE? SHARE YOUR THOUGHTS AND LET ME KNOW IN THE COMMENTS BELOW! I love the wallet! Perfect for my boyfriend, I'll have to look into that one! Great post, and I love your blog!